Find out what our experts have to say about TVS Jupiter! The TVS Jupiter packs more features than you expect and is offered at a competitive price tag. You’ll have a tough time looking for faults in the Jupiter. This scooter is highly recommended if you’re willing to look past the ubiquitous Honda Activa. The least priced variant is TVS Jupiter STD priced at Rs. 63,056 and the most priced variant is TVS Jupiter Classic priced at Rs. 67,877. Choose the TVS Jupiter which fits the bill of you. TVS Jupiter has sold more than 2 million units and is one of the best selling scooters in India. It is the only scooter in India giving a tough competition to Honda Activa. With a value for money prospect the Jupiter has seen a steady growth in the scooter segment. TVS Jupiter comes in four variants namely; Base, ZX, ZX-Disc and Classic. The Base, ZX, ZX-Disc variants comes in Titanium Grey, Midnight Black, Pristine White, Mystic Gold, Volcano Red, Matte Blue, Royal Wine and Stallion Brown colours. While the Jupiter Classic comes in Sunlit Ivory and Autumn Brown colours which look very premium. It is powered by a BS-IV compliant, 4-stroke, single cylinder and air-cooled OHC engine. The Classic comes with a round shaped chrome plated rear view mirrors, classy front windshield design, premium dual-tone seat with detailed stitching and chrome plated backrest. The ZX gets a special Dura Cool seat, which keeps the temperature of the seat 10 degree lower. The variants which have drum brakes at both ends get the special TVS Sync Braking System (SBS). This system automatically activates the front brakes as soon as the rear brakes are pressed thereby offering superior brake control. The TVS patented Econometer technology come equipped with the ‘Eco’ and ‘Power’ Modes makes control over power and fuel efficiency easy. Putting the bike on main stand is an easy affair thanks to the TVS Jupiter’s patented E-Z centre stand. The TVS Jupiter currently competes mainly with Honda Activa 5G, and also with Hero Maestro Edge & Yamaha Alpha. The base variant is priced at Rs.50566, while the ZX is Rs.53514, the ZX-Disc is Rs.55566 while the top end Classic Edition is Rs.56726 (Ex-showroom Delhi). TVS Jupiter is designed in a simple and clean yet attractive manner. While TVS Jupiter Classic looks retro and classy. This is evident from the chrome accents like Chrome mirror, chrome garnish on the front fender and chrome grab handles on the rear. TVS Jupiter’s 3D logo provides a premium yet classic look to the scooter. While the Classic has meticulously designed and amazingly crafted premium dual-tone seat with detailed stitching and chrome plated backrest. The other variants get a wide and comfortable seat, with the ZX having the special Dura Cool seat, which keeps the temperature of the seat 10 degree lower. The all metal body provide structure, strength & flexibility to the TVS Jupiter. 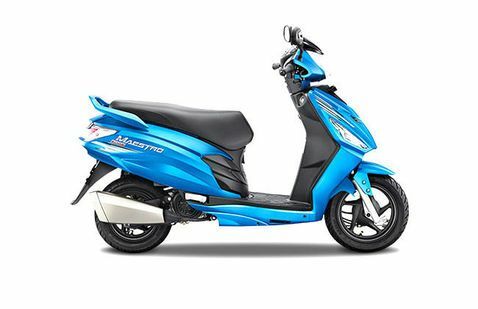 You get maximum comfort as TVS Jupiter has the largest leg space of 375mm amongst all scooters. It gets a clear and clean instrument console, while the Classic variant gets a classic-styled one that blends well with its retro look. The bright class-leading headlamp integrated with Auto Headlamp On (AHO) unit and twin pilot lamps ensure riding safety in low light conditions or when visibility is not adequate. The Jupiter gets clear lens indicators and an LED tail light in the rear. Polished to a glossy mirror-like shine the stainless steel muffler guard does add to the style quotient as well as safety. Putting the bike on main stand is an easy affair thanks to the TVS Jupiter’s patented E-Z centre stand. With 17 litres of storage space and retractable bag hooks the TVS Jupiter allows for multiple configurations and maximum storage capacity. While keeping your luggage conveniently & safely, the underseat storage also has a optional mobile charging port. The TVS Jupiter has an efficient 109.7 cc engine that is 4 Stroke, BSIV-compliant, Single Cylinder, Air Cooled and with an Overhead Camshaft (OHC) which delivers the best-in-class combination of power & fuel economy. With max power of 5.88 kw (8 bhp) @ 7500 rpm and max torque of 8.4 Nm @ 5500 rmp the TVS Jupiter can do amazing pickup of 0-60 kmph in just 11.2 sec. As per TVS, Jupiter can do speeds up to 85kmph. With two riding options of power mode & eco mode, Jupiter gives you the opportunity to get the most power out of the vehicle's high revving engine or to get a better milage. TVS claims the CVT-i technology produces the best-in-class mileage of 62 km/l, thereby help you reach your destination comfortably & efficiently. This ignition technology continually senses vehicle load and power requirement, adjusts accordingly to provide superior ride quality and better mileage. TVS Jupiter provides a strong bond with the road and tension-free long rides by giving the largest 90/90-12 tubeless tyres. These tyres rest on a very durable & stylish but lightweight all black alloy wheels. The advance telescopic shock absorber in the front is tuned to provide better and smoother experience when riding through patch of bad roads. To help eliminate even the smallest jerks caused by rough roads TVS Jupiter features gas charged shock absorber in rear. Coupled with TVS’s Sync Braking System (SBS) the Base and ZX variants braking power is commanded by a 130 mm drum brake units at both ends which provide effective yet safe braking. While a powerful 220 mm disc brake in the front and a 130 mm drum brake unit in the rear is offered in the ZX-Disc and Classic variants, which makes stopping in emergency situations very safe. Similar to a hand-brake in cars, parking brake in Jupiter helps you to comfortably park on uneven and sloped surfaces. 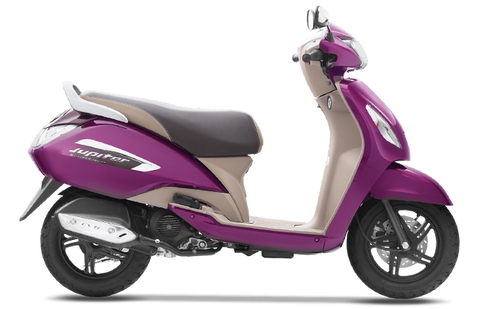 The scooter’s stiff chassis provides a firm foundation for nimble handling and an all metal body instills confidence. TVS Jupiter delivers superior manoeuvrability & class-leading ease of ride with tight turning radius of 1910 mm. With 1275 mm class leading wheelbase and transversely mounted engine the TVS Jupiter provides better stability and extraordinary riding comfort. TVS Jupiter comes with a variety of safety features. TVS is the first in its segment to introduce the unique pass-by switch which ensures that overtaking is easy and safe on the highways or no-horn zones. Riding in the darkest hour is a simple affair now thanks to class-leading headlamp integrated with Auto Headlamp On (AHO) unit which shines brighter, whiter, wider & further than any other. The ZX-Disc and Classic variants come with 220 mm disc brakes in the front, combined with drum brakes in the rear provide a quick but safe stopping power. For added safety and effective braking the drum brake variants (Base and ZX) get TVS’s Sync Braking System (SBS) that is similar to Honda’s CBS. The kick-start is placed ideally close to the feet so that it's easy to start the scooter without getting out of the seat. Other features like retractable bag hooks, an optional mobile charging slot and a parking brake come in very handy. TVS Jupiter has a special tamper-proof and theft-proof key shutter lock for enhanced safety and complete peace of mind. The same key is used to operate the scooter and the external fuel-filler which enables you to fill petrol even without getting out of your seat. This feature is very useful especially when you are carrying valuables under the seat. You can now fill fuel on time and at your convenience thanks to the low fuel indicator that blinks when the scooter is low on fuel.